I wish I could say that this was my idea, but I read it online somewhere. But I couldn't find a good copy of a seed package. I made this, printed it out, and filled it with Cheerios. Print on 8x11" paper from any color printer. Carefuly fold into a packet. Tape the bottom with clear tape. Fill with precisely ten Cheerios (the amount stipulated on the writing), then tuck and seal with tape (more sparingly but still secure). 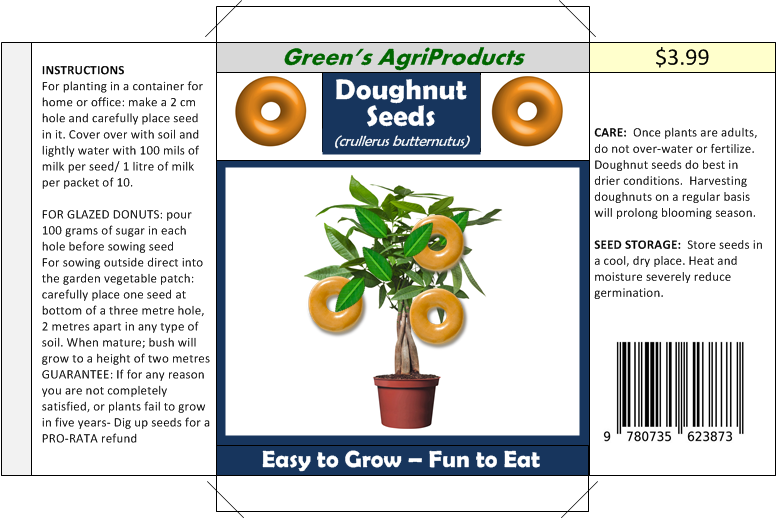 You now have a rather professional-looking packet of ten Doughnut Seeds. Put by each child's breakfast cereal bowls to greet them when they enter the kitchen. Calmly explain that it was about time, given that you see how much they like Dunkin' Donuts. And you guys are old enough to take care of them. My kids opened each package, seemingly oblivious to the packaging obviously being white printer paper with some Scotch tape. They poured out the seeds onto the table. Observed. Ate one. "These are Honey Nut Cheerios," my oldest declared slowly, carefully. I replied, "Very similar, in fact! But of course, Honey Nut Cheerios would never germinate." ...But then a moment later, I announced that I got each their VERY OWN EYE PAD! And distributed them right then and there, proudly and excitedly placing the white medical packet in front of each of them. Then I gushed: "You can wear it on your left eye OR your right eye. Both! I mean, you could go back and forth if you really wanted to. Maybe it would be cool. Maybe some sort of pirate theme style? The possibilities here are endless." At that point, the jig was most definitely up. And the kids concluded that I was most assuredly totally full of (put nicely) it.